View the Menards Weekly Ad offers and Grocery Savings. 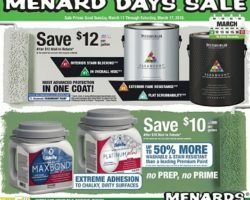 Get this week Menards Flyer, building materials sale prices and rebates or grocery & appliance deals & offers. The retailer offers on select items and areas Same-Day Delivery option – all Same-Day Delivery orders must be places and processed by 5:00 PM from a local store. Deliveries will be made within 3 hours of the email confirmation of your order. Menards is a chain of home improvement centers selling building materials, tools, hardware, garden supplies, electrical supplies, ceiling fans, light fixtures, cabinets, home appliances, doors, windows, paint, wood stain, wallpaper, plumbing supplies, carpet, vinyl, linoleum, groceries, and automotive products. Menards is the third largest home improvement chain in the United States, behind The Home Depot and Lowe’s.